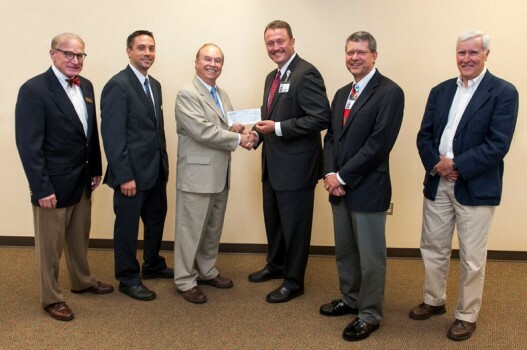 The College plans to begin its 27-month Master of Physician Assistant Medicine (MPAM) in June 2015 and is getting support from Centra, which presented a $250,000 check to the College Aug. 11 in the University of Lynchburg Graduate Health Sciences Building. Check out local coverage: The News & Advance, WDBJ-7, WSET, WSLS. Physician assistants are advanced medical practitioners who are able to obtain medical histories, perform examinations, diagnose illness, and prescribe medications. President and CEO E.W. Tibbs Jr. presented the check to LC President Kenneth Garren as part of the institutions’ continuing partnership to promote community health and to educate the next generation of healthcare professionals. The funds will be used for medical training equipment. Centra has pledged an additional $250,000 to the MPAM program for capital expenditures after the successful achievement of provisional accreditation status of the Physician Assistant Medicine Program by the Accreditation Review Commission on Education for the Physician Assistant (anticipated March 2015). The Greater Lynchburg Community Trust has also awarded $12,850 to LC for the MPAM program for startup equipment. The development of the MPAM program began several years ago with a comprehensive feasibility study that confirmed the local and nationwide need for physician assistant programs. According to the US Bureau of Labor Statistics, employment of physician assistants is expected to increase 38 percent from 2012 to 2022, much faster than the average growth rate for all occupations. Students will complete coursework in basic sciences, pharmacology, clinical medicine, history, physical examination techniques, and surgical and technical clinical skills. Through a series of clinical rotations, students will have numerous opportunities to expand their knowledge under the supervision of licensed health care providers in a variety of specialties. The LC curriculum will also provide opportunities for students to participate in emergency medical services and pre-hospital patient care. Dr. Jeremy Welsh is founding department chair and program director and Dr. John D. (Dan) Johnson III serves as medical director. “The physician assistant has become an essential healthcare provider, increasing affordability and access to care,” Dr. Welsh said. University of Lynchburg is also in the developmental stages of a doctoral degree as a post-professional option for students who have graduated from the Master of Physician Assistant Medicine (MPAM) program. This nine-month program is not an entry-level doctoral program. Physician assistants interested in this program must have previously completed the University of Lynchburg MPAM degree, completed all of their PA professional education, and successfully passed the National Commission on Certification of Physician Assistants (NCCPA) Physician Assistant National Certifying Exam (PANCE). The program offering is contingent upon the approval of the Southern Association of Colleges and Schools Commission on Colleges (SACSCOC). University of Lynchburg has applied for provisional accreditation from the Accreditation Review Commission on Education for the Physician Assistant (ARC-PA). The College anticipates matriculating its first class in June 2015, pending provisional accreditation in March 2015. Provisional accreditation is an accreditation status for a new PA program that has not yet enrolled students, but at the time of its comprehensive accreditation review, has demonstrated its preparedness to initiate a program in accordance with the accreditation standards. The program will not commence in the event that this provisional accreditation is not received.